In a world that seems to grow more hostile towards balanced ecosystems every day, bird feeders serve to stem the tide of ruin. 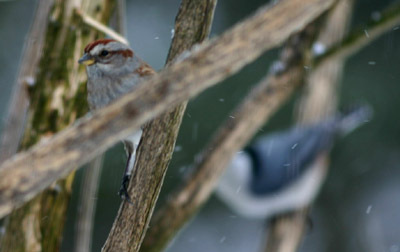 The beneficial impact of individual feeders cannot be underestimated, especially in winter. The largesse of a single kind soul can support an astonishing menagerie of birds (and possibly squirrels) through long, uncertain months. I noticed just how diverse a northeastern feeder clientele can be as I watched Sara’s mother’s entourage at work. Ann is, as I’ve mentioned before, one of our biggest supporters and the queen of backyard birding. Her strategic array of feeders coax just about every seed-eating avian species in Potter County, Pennsylvania to her door. It’s no trick for a feeder to attract Black-capped Chickadee. Equally undeterred by inclement weather and human presence, chickadees possess a keen knack for survival that belies their adorable antics. Finches always find a feeder as well, in this case House Finch and American Goldfinch. City birds actually keep their distance; though I spotted European Starling and Rock Pigeon, neither of those species came to the feeder during my watch. Flocks of House Sparrow, on the other hand, felt quite at home. They were, by no means, the only sparrows at Ann’s feeders. Besides Dark-eyed Junco, I noticed Song, White-throated, American Tree, and a rarity for these parts, a perfect Fox Sparrow! One of the best birds to watch at a bird feeder has to be the White-breasted Nuthatch. They are so sleek, so handsome with their high-contrast charcoal and linen plumage, and also entertainingly acrobatic. I didn’t see any Red-breasted Nuthatch at the feeders, though they did pop up more often than any other bird but chickadees when I was in the woods. The sharpest red at the feeders instead belonged to the matched pair of Northern Cardinal, new acquaintances of the backyard brood. Their scarlet presence was set off nicely by the bullying Blue Jay, itself no stranger wherever suet might be found. Speaking of suet, Ann’s offerings attracted both Hairy and Downy Woodpecker. Observing the species side by side offers real insight into the subtle differences between these two look-alikes. Another woodpecker we viewed from the house was a magnificent Pileated, though unsurprisingly, this bird didn’t mix with the feeder crowd. Too bad it didn’t; the prevailing atmosphere in the backyard might best be described as collegial, with a motley mix of birds shoulder to shoulder at any given time. Everyone got along famously and the Mourning Dove didn’t seem sad at all. The party even tempted a Brown-headed Cowbird couple, most unexpected this time of year. Good food and friends are all any species could want on a frosty winter day. Where Are You Birding This Final Weekend of July 2016? Just how dangerous are birds?